Lindsay’s Note: This is a guest post from Jessica Cox, RD from Emeals. I thought it would be interesting to get a take on how one can eat clean on a budget since there is a common perception that eating clean is more expensive (which it can be). Enjoy! Out with the Atkins diet and in with dining caveman-style. The Paleo pallet focuses on meats, vegetables and nuts and avoids items such as sugar, grains and processed foods. Below are some simple tips to go Paleo without breaking the bank. Create a budget. Just having a plan can save your hard earned dollars. Each week take stock of what you already have, so you’ll know what you really need and what you really don’t. The same goes for your grocery budget – if you plan ahead of time and use a Paleo shopping guide, you’re more likely to stick to a certain price point. Plan your meals. Look at your local grocery stores specials, and then create your meal plan and grocery list based on those sale items. Start with focusing on the meats that are on sale since meats will be the highest portion of your grocery spending on a Paleo diet. To take the stress out of the process, eMeals has created an ongoing weekly Paleo Plan with recipes and grocery lists already laid out. Buy in season. Check out Epicurious’ map for what’s in season by state and month. Shopping in season is a great way to save money – especially if you stock up through freezing items. To take advantage of berries when they are on sale, buy in bulk, wash them, pat them dry, lay them out on a cookie sheet and then freeze them. Once frozen, transfer the berries to a freezer bag. Load up on sales. When a staple item like frozen vegetables, turkey bacon, tuna or canned coconut milk goes on sale; stock up big time! Most stores have their ads available online and will email them to you weekly. It makes it easy to quickly check sales before you go shopping. Buy in bulk. Many times when you stock up on things like nuts and dried fruits from the bulk bins it is a lot cheaper than buying it in a pre-packaged form. Instead of going for the convenience of throwing a bag of something in your cart, take a few moments to browse the bulk section and watch the savings add up! 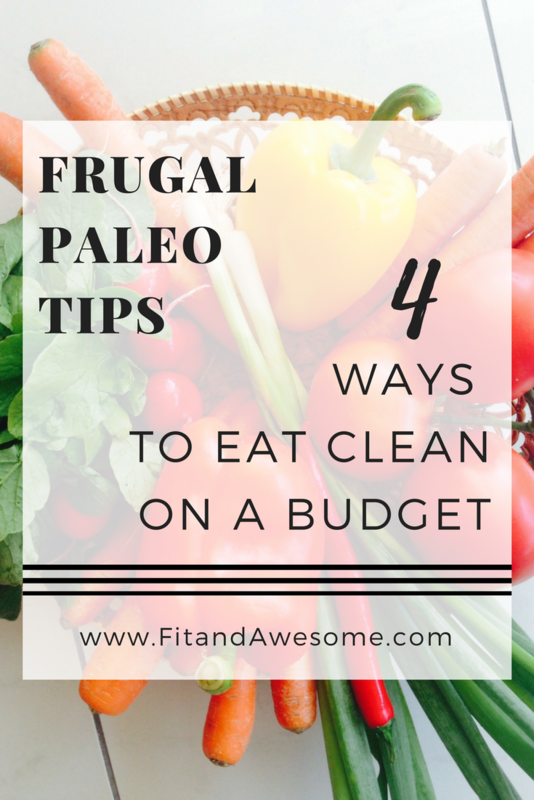 4 simple tips to go Paleo without breaking the bank. The Paleo diet focuses on meats, veggies & nuts and avoids sugar, grains and processed foods. I am horrible about not blowing my budget when it comes to clean eating. I think I need to plan better. Great tips!